Arsenal legend Ian Wright has criticised Alexis Sanchez for his poor performances for Manchester United and suggests he should be left of Mourinho’s team. The Chilean winger has endured a dismal start to the season, failing to find the back of the net in any of United’s seven matches so far this term. The 29-year-old has failed to live up to the high expectations the club had for him when he signed from Arsenal back in January, struggling to influence games from the left-hand side of midfield or in central positions for Jose Mourinho’s side. The Red Devils are already eight points off the pace in the Premier League, most recently dropping points at home to newly-promoted Wolves on Saturday and supporters are starting to turn on the players and the manager as a result. According to the Manchester Evening News, Wright – who now works as a pundit – has slammed the former Gunners star for his recent displays in a Man United shirt and stated that he was similarly ineffective at the Emirates during his last few months with the club. “Coming to the end of his Arsenal time, he was playing in a fashion that you thought he just wants to get away,” Wright told reporters on Tuesday. “His body language was bad, he was throwing his arms about. And he was doing exactly what we’re seeing him do now: give the ball away. “Man United asked Chile to rest him, and they did, he had a pretty good pre-season and I thought ‘Ok, he’s back’, but it’s not happening for him. The Red Devils are in Carabao Cup action tonight against Derby County at Old Trafford and are already 1-0 up through a Juan Mata strike in the third minute of the game. 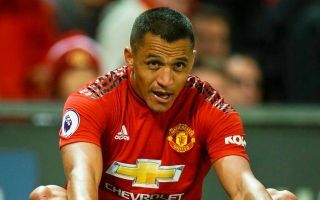 Sanchez was granted a rest ahead of Saturday’s Premier League showdown with West Ham at the Olympic Stadium, which is a must-win game for United as they look to get their domestic campaign back on track. The diminutive winger was one of the best players in England during his time at Arsenal, but for whatever reason, he has so far been unable to replicate that high level of performance in a Man United shirt. Supporters will be hoping that changes quickly with tough games piling up and the team could certainly use his attacking flair to help improve their effectiveness in the final third of the pitch in the coming weeks.